Robert Bruce was born in the year 1274, on the Feast of the translation of St. Benedict, being March 21st, and was undoubtedly of Norman origin. In an annual roll containing the names of those knights and barons who came over with William the Conqueror, we find that of Brueys; and from the Domesday Book it appears that a family of the same name were possessed of lands in Yorkshire. Coming down to a later period, 1138, when David I. of Scotland made his fatal attack upon England--fatal, that is, to himself and his people--the English barons, previous to the battle of Cutton Moor, near Northallerton, sent a message to the Scottish king, by Robert Bruce, of Cleveland, a Norman knight, who possessed estates in either country. Upon his death, this knight bequeathed his English lands to his eldest son, and those in Annandale to his younger, who received a confirmation of his title by a charter of William the Lion. From this root sprung Robert Bruce, the competitor for the crown with Baliol, whose grandson was the more celebrated Robert Bruce, the younger, Earl of Carrick in virtue of his mother's title, and afterward King of Scotland. He was the eldest of three brothers and seven sisters, whose marriages with some of the leading families of Scotland proved an important element of success to the future hero. His earliest years were passed at the castle of Turnberry, where his mother resided; but as he grew older, his father, who considered himself an English baron, thought proper that he should be removed to the English court. The friendship subsisting between Edward the First and the Earl of Carrick induced the former to adopt the earl's son; so that the confiding monarch trained up his mortal enemy in the use of those arts and weapons which were one day to be turned against himself. The family of Bruce, as we have already noticed, were competitors for the Scottish throne with Baliol, in whose favor an award was pronounced by Edward, when called upon to arbitrate between them. At this time the elder Bruce was far advanced in years; his son, the Earl of Carrick, was still in the prime of life, and his grandson, Robert Bruce was eighteen years of age. Upon the old man being required to do homage for his lands in Scotland to the new monarch of that country, he indignantly refused, exclaiming, "I am Baliol's sovereign, not Baliol mine; and rather than consent to such a homage, I resign my lands in Annandale to my son, the Earl of Carrick." But Carrick was not less proud, or averse to anything that might call in question his claim to the crown of Scotland, and in like manner refused to hold any lands of Baliol. As, however, according to the feudal law, he must either divest himself of his estate, or do homage for it, he adopted the former alternative, and resigned the lands of Annandale in favor of his son, Robert. The young baron, less scrupulous than his relatives, did not hesitate to accept his father's gift, which, upon feudal principles, carried with it the title of Earl of Carrick, and did homage for the same to Baliol. By his father's death, in 1304, he became possessed of the family estates in England. From this time Bruce played his part with skill, though in justice it must be allowed that his patriotism was not altogether without the alloy of a selfish ambition; and perhaps it would be expecting too much from human nature, even in its best and highest forms, to look for anything else. Neither can we free him from the charge of dissimulation in that he swore a fealty to Baliol, which it is plain he never intended to observe, and affected gratitude and attachment for the English monarch, while in secret he was preparing to undermine him. An excuse for this has been sought by his more partial admirers in the necessity of the case, arising from the well-known sagacity of Edward, who would otherwise have penetrated his purposes and crushed them in the bud without scruple. Nor was this the only obstacle in his path to empire. Upon the failure of Baliol and his only son, Edward, the ancient and powerful family of the Comyns were ready to dispute his title to the crown, which they claimed for themselves. John, commonly called the Red Comyn, who had been the determined opponent of Wallace, possessed, in the event of the monarch dying without issue, the same right to the throne which was vested in Bruce himself. He, too, had connected himself by marriage with the royal family of England, and was at this time one of the most powerful subjects in Scotland. When Baliol leagued with Comyn to throw off the supremacy of Edward, whose hand, whether justly or not, had raised him to the Scottish throne, the Bruces and their party, tempted by the promise of a crown, lent their best aid to the English monarch. Upon the termination of the campaign the elder Bruce demanded the fulfilment of Edward's promise, to which the latter indignantly replied that he had not come into Scotland to conquer a kingdom for him; so that Bruce reaped nothing else at the time from his service, than the satisfaction of seeing his rival, Baliol, dethroned, and the influence of the Comyns effectually diminished. In 1296 Edward held a parliament at Berwick, compelling the Scotch barons to do him homage, and the young lord of Carrick concurred in the national submission. But notwithstanding this outward show of fealty, he became, in the time of Wallace's success, suspected of entertaining designs upon the crown. At first, indeed, he had joined against Wallace, and wasted the lands of his adherent, Douglas, with fire and sword; yet, soon after his return home, he summoned the Annandale men, who were the vassals of his father, then in the service of Edward, and thus addressed them: "You have already heard, without doubt, of that solemn oath, which I lately took at Carlisle, and I cannot deny the fact; but the oath was a foolish one, and exacted by fear; it was my body that took the oath, and not my mind; but its having been taken at all is now to me the cause of much remorse and sorrow; yet erelong I hope to be absolved from it by our Holy Father. In the meanwhile, I am resolved to go and join my fellow-countrymen, and assist them in their efforts to restore to its liberty the land of my nativity, for none, as you know, is an enemy of his own flesh, and as for me, I love my people. Let me beseech you, then, to adopt the same resolution, and you shall ever be esteemed my most dear friends and approved counsellors." To this request the men of Annandale deferred giving any answer till the morning, and took advantage of the night to retire, so that Bruce could only join the insurgents with his own vassals of Carrick. The first disappointment might have taught Bruce to desist from his design, for which the time was not yet ripe; but blinded by ambition, he entered into a strict alliance with Wishart, the Bishop of Glasgow, and the Steward of Scotland, the principal leaders of the insurrection. Upon joining his new associates, he found their purposes utterly incompatible with his views upon the crown. Wallace, the soul of the party, had ever supported the claims of Baliol, and his great supporter, Sir Andrew Moray, a near connection of the Comyns, had the same object. During the campaign, therefore, of 1298, which concluded with the battle of Falkirk, Bruce shut himself up in his castle of Ayr, maintaining a cautious neutrality, while his father continued to reside in England and to serve Edward in his wars. The king, however, did not admire this cold system of neutrality. He in consequence determined to attack the castle of Ayr, and Bruce, dreading the consequences, razed it to the ground, and sought an asylum in the mountain fastnesses of Carrick. In the following year, when Wallace had resigned the regency, John Comyn, of Badenoch, and Sir John de Soulis, were chosen governors of the kingdom, and the party of Bruce availed themselves of the opportunity to advance his influence by opposition to those in power, and by defeating every measure taken for the public benefit. An attempt was made by those who really wished well to the national cause, or who dreaded that their disunion might be fatal to all alike, to reconcile the contending factions; with this view they elected Bruce, and Lamberton, Bishop of Glasgow, joint regents in the name of Baliol; but this ill-assorted coalition soon fell to pieces, as might have been expected, where the views which one party entertained in secret were so utterly opposed to the avowed purposes of all. The policy which actuated Bruce on this occasion may be easily explained. It was clear that Edward would never consent to the restoration of Baliol, then in exile, and the Comyns had taken so decided a part against him, that it seemed most improbable he would ever consent to raise one of that family to the throne. Continuing, therefore, the same line of duplicity with which he had commenced, and which he had only abandoned for a single instant in the vain hope of persuading the party of Wallace to openly adopt his claims, he now endeavored by submission and affected attachment to win the favor of the English monarch. Edward, he well knew, had the power, could he be brought to entertain the inclination, to place him on the Scottish throne, and if this point were once attained, Bruce trusted that means would afterward occur of shaking off all dependence upon his benefactor. In these designs he to a certain extent succeeded, but not in his main object. If he was crafty, Edward was yet craftier. He had fallen into the same error that his father had, in 1296, and was outwitted by the superior political ability of him whom he had intended to deceive, and who, it must be confessed, was equally insincere. Edward cheated both father and son, by holding out to them the hope of a crown he never meant them to attain, his object being to unite the two countries; an excellent purpose in itself, if we could only bring ourselves to overlook the fraud and violence by which it was to be accomplished. When, therefore, the Comyns submitted, in 1304, and he proceeded to the settlement of his new dominions, the Earl of Carrick found that his only gain was the being employed among the commissioners in organizing a system of government. He had, however, reaped no little advantage from his dissimulation. While Baliol was an exile and Comyn in disgrace, he had preserved his estates, and won the king's confidence without losing, but rather augmenting, his influence with the Scotch. At the same time he saw that Comyn was still powerful; his claims to the throne were more generally admitted by the people, and without his concurrence nothing could be effected. Thus situated, Bruce submitted to his rival this alternative: "Give me your land, and I shall bind myself to support your title to the kingdom, and, when we have expelled our enemies, to place the crown upon your head; or, if thou dost not choose to assume the state of the kingdom, here am I ready to resign to you my estates, on condition that you second me in my efforts to regain the throne of my fathers." Comyn accepted the latter alternative, but immediately betrayed the design to Edward, and sent him the letter, or indenture, by which Bruce had bound himself. But the latter, when suddenly charged with it, denied his hand and seal with a coolness that could only belong to one long practised in the arts of dissimulation, and demanded time to prove his innocence. Arch-deceiver as the English king himself was, he yet allowed himself to be duped by this specious effrontery, and Bruce escaping into Scotland, murdered Comyn in the church of the Grey Friars, at Dumfries. Soon afterward he was crowned at Scone, and the revolution spread far and wide; upon hearing which, Edward sent an invading army into Scotland. Superiority of force and military skill soon compelled Bruce to retreat to the mountain fastnesses, that offered a better place of security than the strongest castle, for castles might be stormed; but here, if danger threatened him at one point, he had only to retreat to one more remote and more rugged, and thus at any time was enabled to baffle his pursuers when he found them too powerful to be resisted. A series of fights--battles they could hardly be called--and adventures now ensued which have all the coloring of romance, but which entailed so much of hardness and privation upon his followers, that after a while it became evident he would not be able much longer to keep them from abandoning a cause so desperate. Then, again, a spark of hope was kindled by the disaffection growing out of the severity which Edward exercised upon all who had been in arms to resist him. Numbers in consequence flocked to Bruce, and fresh adventures succeeded of a yet more romantic nature than those already mentioned; the fortunes of the wanderer seeming now to be at the lowest ebb, and then again rising into a prosperous flood, which as rapidly subsided, making it a matter of some difficulty for him to escape being stranded by the falling waters. It was during this season that Douglas disgraced himself and the Scottish name by barbarities that have never been surpassed, and rarely even equalled. The death of the great Edward--for great he was, in spite of all his faults--and the accession of his son, the feeble Edward II., left an open field to Bruce, who was as much superior to those that now opposed him, as he had been overcrowned by the genius of his late adversary. He marched from victory to victory, and would, no doubt, have brought the contest to a happy termination, had he not been seized by an alarming sickness. At first, it threatened to be fatal; things were again beginning to look gloomy for Scotland; but in the moment of extreme peril, he shook off his disease by a strong effort, and once more led his followers through a series of triumphs, which were crowned by the great battle of Bannockburn. Though we cannot allow the ambition which seeks a crown to pass for patriotism, it is impossible to deny the highest praise to the courage, firmness, and ability displayed by Bruce through the whole of this trying period. None may deny that he deserved a crown, and when once obtained, it acquired a lustre from the talents of him who wore it. Bruce soon found himself in a condition to assist his brother Edward in the attempt to drive the English out of Ireland. But here the usual good fortune of the Scotch abandoned them. After a hard-fought campaign, attended by many vicissitudes, his sagacity saw that the attempt was hopeless, and he returned to Scotland. Shortly afterward, the turbulent and aspiring Edward Bruce was slain in battle. His wonted success attended Bruce in the field, in the midst of which, however, a plot was formed against his life and government. Fortunately it was revealed in time by the Countess of Strathearn, to whom the conspirators had the weakness to confide their intentions; and soon afterward, to crown his prosperity, Edward II. was compelled by a series of defeats to conclude a peace. But Bruce's health began to be impaired, and when war again broke out between the countries, upon the deposition of Edward II. 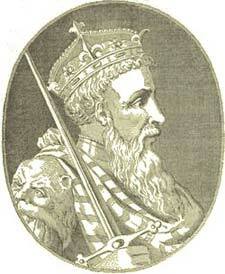 and the succession of his son, Edward III., he was unable to lead his projected expedition against England. It ended in failure, if not in defeat. A short interval of health and hope gleamed upon him after this attack, and peace was concluded between the two countries, greatly to the dissatisfaction of the English, who, justly enough, considered themselves sacrificed to the ambition of the queen-mother, Isabella, and of her favorite, Mortimer. But this momentary promise of health and vigor soon passed away, and it became plain to all that the life of this brave and sagacious monarch was drawing rapidly to a close. In expectation of the final event he had given orders to have a magnificent tomb made at Paris; which was brought to Bruges, thence through England into Scotland, and on its arrival erected in the church of the Benedictines at Dunfermline. Bruce died in his fifty-fifth year, and was buried in the abbey-church of Dunfermline, as he had desired. In the prime of his life Bruce was upward of six feet high; his shoulders were broad, his chest full and open; the cheek-bones strong and prominent, and the muscles of the back and neck of great size and thickness; his hair curled short over a broad forehead, and the general expression of his face was calm and cheerful; yet, when he pleased, he could assume a character of stern command. Such, at least, Bruce has been described by the old historian, and we may easily believe it, since the outward semblance agrees so well with what is recorded of his life and actions.